In this chapter Cecil starts off by telling a story of a boy named Juma. Cecil writes, "As I understand the story, Juma's mission had been to go to the West and learn. He was then to come back and translate the wisdom of the educated and enlightened. When Juma returned, he had to relearn the wisdom of the village." I believe the moral of the story is the boy (Juma) had gained knowledge and information from living in the Western culture but he had lost his own sense of wisdom that the people of his village rely on. As Cecil writes, "They learned by going inward and allowing themselves to feel and to hear what was around them." He goes on to say, "Juma had tried to figure out the answers by logical investigation and scrutiny. He had cut himself off from his inner wisdom." My understanding of this is Juma lost his sense of inner knowing and intuition. He stopped trusting his heart. Cecil shares, "That happens to many of us. Perhaps to you as well. You started with that uninhibited insight about life when you were a child. You spoke out of innocence, and sometimes others laughed at your words, even when you showed insight. The inhibiting forces of society pushed you to deny what you knew." Sadly, I have seen this with myself and others after taking a program or a course of some kind. It starts off with the best intentions but subtlety you start to loose trust in your own gut feelings because you are being taught not to trust in them. You are being told that you could be "deceived" or "mislead". You are to put your trust in the leader or teacher or program instructions etc, etc. I see similarities in Cecil's story about Juma and these examples I just gave as the difference between law (application) verses grace (transformation). The same type of influences, or should I say negative influences, can also happen in writing. 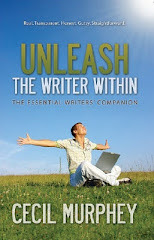 Cecil says, "If you want to write like everyone else, then do nothing differently. Use the same words and speak the same thoughts. But if you want to enrich others, you have to learn to perceive life differently." Cecil advices us that if we want our writing to have depth, texture, meaning, and endurance, it must go beyond what others see. He writes,"That doesn't make you a superior writer, but it does make you different." He goes on to say, "If you want to change, you can adjust the way you see things." Perhaps there is a Juma in all of us just waiting to break free. As Cecil shares, "Like all of us, you have some bias, but you can write with impaired vision. Or you can do what Juma did. You can listen to what your heart tells us and go inward. You can learn to see life differently." The Aphorism for this chapter is: "I've spent much of my life being like others. Now I want to spend time being like the real me." Aphorism #22: " I've spent much of my life being like others. Now I want to spend time being like the real me."